Houseless, not homeless! : Let us not have holiday seasons dictate what we ALL should be doing naturally and with righteousness. Blessings to those who DO care! Let us not have holiday seasons dictate what we ALL should be doing naturally and with righteousness. Blessings to those who DO care! We all as humans must no longer look to .org's, 501(c)(3)'s, misguided church's and the like to do what we should already be doing - helping in a real, natural way by loving our neighbor as yourself! From the looks of all of the human's being annihilated in the U.S.A., a person might come to think that U.S.A. citizens must NOT love themselves, therefore how can one expect them to love their neighbors? The picture in the story below which was posted on the NYPD's Facebook page on or about T u esday, the 27th of November, 2012 it had received more than 320,000 "likes," 77,000 "shares" and 20,000 comments. There were of course those who wrote with displeasure. None-the-less, whe ther for a photo opt, to get a good feeling for ones self, or just for some other reason, we all should be doing more and caring for others in a real, natural way. Yes, it is better to do such acts without others watching and for some sort of recognition, but these days it DOES appear that humans need some sort of "for me" also with doing acts of kindness. Not all mind you, but let's face it,in the United States of America, the business of helping another is alive and well. Break these chains of doing for another for ones self without focus of a tax break, recognition and/or self gratification and you will rest each night knowing that you are that much closer to being a real human. A photo of a New York City police officer kneeling down to give a barefoot homeless man in Times Square a pair of boots on a cold November night is melting even the iciest New Yorkers' hearts online. 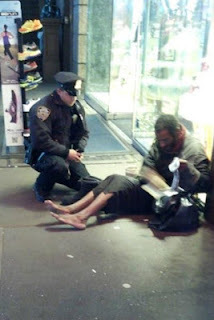 On Nov. 14, NYPD officer Lawrence DePrimo, who was on counterterrorism duty in Times Square, saw the older homeless man without shoes sitting on 42nd Street. DePrimo, 25, left and then returned with a pair of $100 boots he bought at a nearby Skechers store. "It was freezing out, and you could see the blisters on the man's feet," DePrimo, a three-year veteran of the department who lives with his parents on Long Island, told the New York Times. "I had two pairs of socks, and I was still cold." The random act of kindness was captured by Jennifer Foster, a tourist from Florence, Ariz., who was visiting the city. Foster, communications director for the Pinal County Sheriff's Office in Arizona, emailed the photo to the NYPD with a note commending DePrimo. "The officer said, 'I have these size 12 boots for you, they are all-weather. Let's put them on and take care of you,'" Foster wrote. "The officer squatted down on the ground and proceeded to put socks and the new boots on this man. "I have been in law enforcement for 17 years," she continued. "I was never so impressed in my life. ... It is important, I think, for all of us to remember the real reason we are in this line of work. The reminder this officer gave to our profession in his presentation of human kindness has not been lost." Foster's photo was posted on the NYPD's Facebook page on Tuesday, where it received more than 320,000 "likes," 77,000 "shares" and 20,000 comments—most of them praising DePrimo, who seems to have restored Facebook's faith in humanity. "This is one hell of a police officer," Desiree Wright-Borden wrote. "Wow," Jack Horton wrote. "It's nice to know there are still good people out there." "Angels truly do walk on earth!!!" Charlene Hoffman-Pestell wrote. Some commenters, though, were skeptical, saying the photo could have been staged. "Clever stunt!" Louis Zehmke wrote. "The hobo is 'parked' at the entrance of a shoe shop." But Foster claims DePrimo had no idea he was being photographed: "The officer expected NOTHING in return and did not know I was watching."